In the second period Myrmidons relaxed the pace a bit and still managed to score two more goals to complete the big win. Johnson Mathews scored the fifth goal in the 62nd minute and Kasare fired home the sixth in the 70th minute. 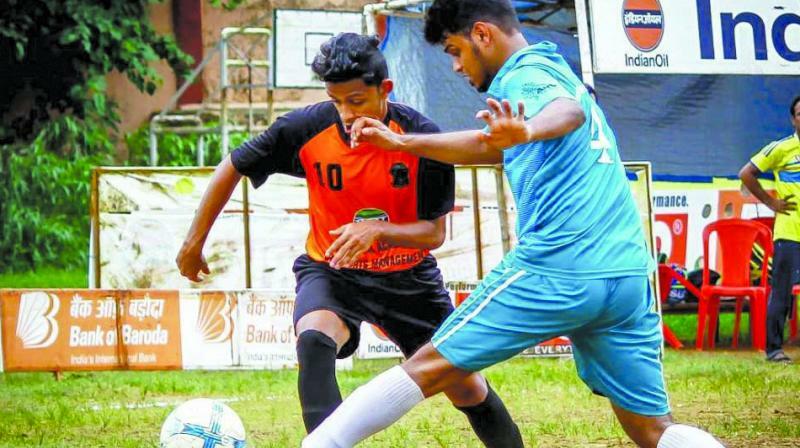 A youthful Myrmidons Sports Club romped to a 6-0 win against Friends Sports Club in a fifth round Group-A league match of the third Borivali Premier Football League (BPFL) at the St. Francis D’Assisi High School ground, Borivali (West). The highlight of Myrmidons victory was the brilliant efforts of Mithilesh Kasare who notched up a fine hat-trick scoring three of the six goals. Kasare’s teammates Kunal Patel netted a brace of goals and Johnson Mathews scored one to round off the winning tally. Myrmidons went on the offensive from the start and completely dictated terms, but they had to wait till the 12th minute to open the scoring with Kasare scoring his and the team’s first goal. Three minutes later Kunal Patel doubled the lead and was again on target with the third goal in the 29th minute before Kasare struck the fourth goal a minute from the half-time whistle. In the second period Myrmidons relaxed the pace a bit and still managed to score two more goals to complete the big win. Johnson Mathews scored the fifth goal in the 62nd minute and Kasare fired home the sixth in the 70th minute.